Properties in Roullet-Saint-Estèphe average 4.7 out of 5 stars. House 8 places 300m from the space CARAT. Property 4: House 8 places 300m from the space CARAT. Beautiful residence in CharentePoitou in the middle of the vineyards. 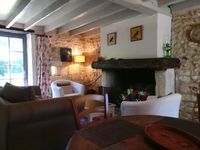 Property 7: Beautiful residence in CharentePoitou in the middle of the vineyards. Apartement Ruisseau - a light and airy property beside pool. Property 17: Apartement Ruisseau - a light and airy property beside pool. Spacious 5 bedroom house with swimming pool in fully enclosed garden. Property 19: Spacious 5 bedroom house with swimming pool in fully enclosed garden. Luxury apartment with terrace, sauna, tennis, and heated pool. Property 21: Luxury apartment with terrace, sauna, tennis, and heated pool. Property 25: Luxury apartment with terrace, sauna, tennis, and heated pool. House in a nice restored loft. At the heart of the countryside. Property 28: House in a nice restored loft. At the heart of the countryside. 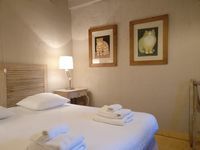 'LES SOUCHES' Calm and peaceful surroundings with heated pool. Property 38: 'LES SOUCHES' Calm and peaceful surroundings with heated pool. Secluded Luxury House. Private Pool. Between Cognac, Angouleme, Royan. Bordeaux. Property 41: Secluded Luxury House. Private Pool. Between Cognac, Angouleme, Royan. Bordeaux. Luxury apartment with terrace, sauna, tennis, pool. Property 42: Luxury apartment with terrace, sauna, tennis, pool. We would stay again in a heartbeat!